We were happy to present our completely automatic bloc Pragmatic® 46 RRPOC 16/16/4. We were happy to present our completely automatic bloc Pragmatic® 46 RRPOC 16/16/4 for filling of mineral water in PET bottles at the Ambalaj 2011 packaging exhibition in Istanbul, Turkey. The machine attracted the interest of numerous visitors thanks to its hygienic design (ULTRA CLEAN), perfected construction and highly efficient capacity of 10000 bottles per hour at 0,6 L containers. The resulting filling speed of 600 bph per filling valve is among the leading in this class. This rotary neck-handling bloc utilizes overpressure filling and dosing by product level. 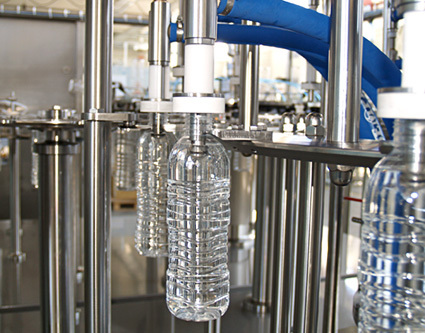 All processes, including the integrated system for automatic CIP washing, are managed by an intelligent control system. The machine is embraced by a standalone glass fencing allowing unobstructed view to every process at any time and contributing to further improve the level of hygiene.